Rockin' Out: Popular Music in the U.S.A.
Rockin' Out: Popular Music In the U.S.A., 6/e, analyzes the music and business of rock ‘n roll. This comprehensive, introductory text takes readers from the invention of the phonograph to the promise of the Internet. Topics include: the rise of television idols, the proliferation of alternative sounds, and the influence of digital production techniques. This title is available in a variety of formats – digital and print. Pearson offers its titles on the devices students love through CourseSmart, Amazon, and more. To learn more about pricing options and customization, click the Choice tab. Provides A Historical Framework - The first three chapters provide a historical context by examining the pre-history of rock and roll. These chapters cover musical influences, technological advances, industry developments, and more. Engages Students Through Music - New listening guides in the final chapters enhance discussions of key artists like Lady Gaga and influential genres such as electronic dance music. An updated song index provides students with a useful study tool for locating song titles in the text and placing them in their historical context. Examines the Business of Music - Technology has shaped the production and consumption of popular music, and the text shows students how. An updated Chapter 12 puts more emphasis on changes in technology and the organization of the music business from the 1990s to the present. Explores Music’s Societal Impact - Coverage of music’s political context and the power of consumer preferences teaches students that music fans and artists are an important social force. Discussion of race and gender issues helps readers understand how these issues impact the development of music. Enhances Historical Narrative with New Co-author - Steve Waksman, professor at Smith College and heavily published rock scholar, has been brought on as co-author, thoroughly revising each chapter. Updates include new research and more current literature. New co-author - Steve Waksman, professor at Smith College and heavily published rock scholar has been brought on as co-author for the 6th edition. Listening Guides - New listening guides have been added to the final chapters of the new edition, enhancing discussion of key artists like Lady Gaga and influential genres such as electronic dance music. New Material - Addition of engaging and informative new material — especially in punk, rap and metal, as well as the current scene and the future of music — without adding length or losing the thread of earlier editions. Updated sources - Story narrative and sources updated and enhanced throughout. A deeper analysis with characteristically accessible prose. Comprehensible - Final chapters significantly reorganized to present a more readable arc of history. Charity Rock and Mega-Events: Who Is the World? Reebee Garofalo is Professor Emeritus at UMass Boston, where he taught for 33 years. 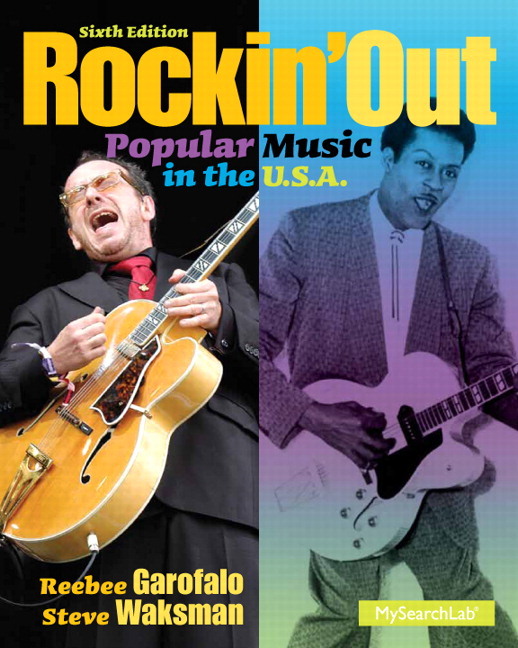 His most recent book is Rockin' Out: Popular Music in the USA. He has written numerous articles on popular music for popular as well as scholarly publications and has lectured internationally on a broad range of subjects relating to the operations of the music industry. Garofalo has been active in promoting popular music studies internationally, as a member of the Executive Committee and past Chairperson of the International Association for the Study of Popular Music-US, and an editor for several popular music journals, including the Journal of Popular Music Studies. At the local level, Garofalo serves on the organizing committee for the HONK! Festival, an annual gathering of activist street bands. For relaxation, he enjoys drumming and singing with the Blue Suede Boppers, a fifties rock 'n' roll band, and marching with the Second Line Social Aid and Pleasure Society Brass Band, an activist New Orleans-style brass band. Steve Waksman has turned a lifelong involvement with music as a player and listener into a career as a scholar of rock and pop. Associate Professor of Music and American Studies at Smith College, his works include the books Instruments of Desire: The Electric Guitar and the Shaping of Musical Experience, and the award-winning This Ain’t the Summer of Love: Conflict and Crossover in Heavy Metal and Punk. He has contributed essays to several journals and edited collections, including the Cambridge Companion to the Guitar, the Continuum Encyclopedia of Popular Music of the World, Listen Again: A Momentary History of Pop, and Metal Rules the Globe. In 2008, Waksman was the keynote speaker at the Rock and Roll Hall of Fame’s American Music Masters event honoring the legacy of musician and inventor Les Paul. He is currently researching a new book on the cultural history of live music and performance in the U.S. from the mid-nineteenth century to the present, and co-editing the Sage Handbook of Popular Music with Andy Bennett.